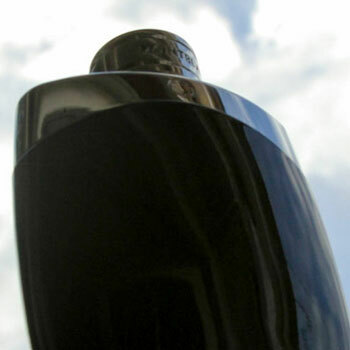 Montblanc Legend Fragrance Review: Does This Men’s Cologne Do The Meisterstrück Justice? Designed as an ode to Montblanc’s revolutionary Meisterstrück pen, Legend is an affordable fragrance for men. Sometimes overshadowed by its sister product, Individuel, it still has its own loyal following. In the following article, you’ll read our review of Mont Blanc Legend. 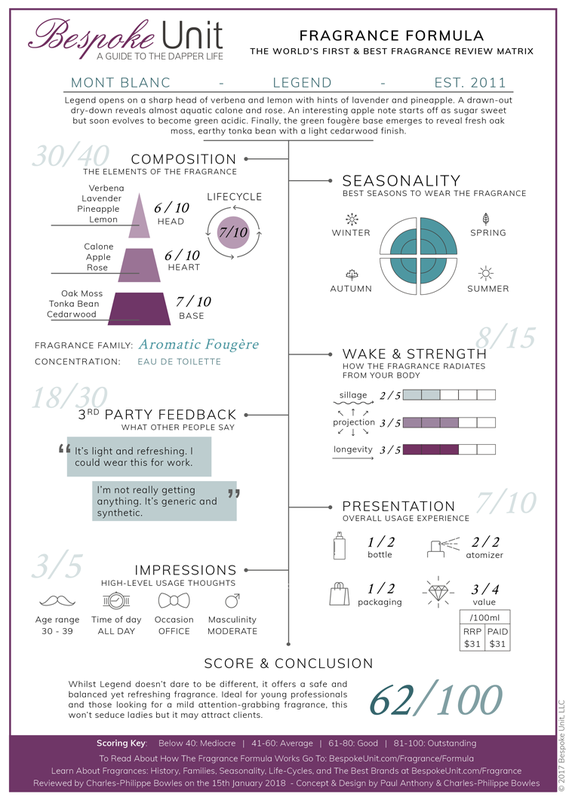 We’ll be analysing the fragrance based on its composition, seasonality as well as its strength and value for money using the Bespoke Unit Fragrance Formula. Over 10 years after Individuel’s release, Mont Blanc Legend was introduced to the market in 2011. The nose behind this fragrance was Olivier Pescheux, known also for his work on Paco Rabanne 1 Million as well as Legend’s following variants. The aim was to create a fresh and confident fougère that combines contrasting aromatic notes to create a homage to Mont Blanc’s legendary writing utensil. Following the intentions mentioned above, Legend is a fresh fragrance featuring a number of aromatic notes. Despite its loaded fruity components and aquatic touch, it’s built around a distinctively fougère frame. Therefore, sits closest to the Aromatic Fougère fragrance family. Legend features a crisp head by opening on sharp verbena and lemon notes. These citrus tones linger while hints of lavender and pineapple begin to emerge. Whilst the latter notes are somewhat faint compared to the citrus scent, they are present enough to create a more rounded opening. Although a note typically found in the head, there is a distinctive calone presence in the heart. A component usually found in aquatic fragrances, this aldehyde is rather fatty and creates an ozone breeziness. Combined with rose notes, it’s overtly floral, which draws out a sweet red apple aroma too. Interestingly, as the rose fades, the calone alters the apple instead. This transitions from a sugary red note to something greener and more acidic. The resulting base consists of oak moss and tonka bean with a refreshing cedarwood finish. While the oak moss creates green notes of freshly-mown hay, the earthy tonka bean (or coumarin) gives off a slight vanilla note with a sweet finish. Aside from the head being drawn-out and lengthier than most fragrances, Legend’s structure follows that of a classic three-tiered aromatic fougère. Notes of lavender can be found in the head while oak moss and tonka bean are present in the base. That is not to say that the fragrance is linear but it follows a very conventional sequence of structured aromas. However, it’s not an overly strong fragrance. Firstly, the sillage is quite weak and only gives a tight trial of a few centimetres from the body. When stationary, the projection is tight but noticeable from a decent range. For instance, anyone shaking your hand will get a few notes whilst someone following you down a corridor may not notice it straightaway. With regards to longevity, it has a decent lifespan but may dwindle around lunchtime and will require a top-up. Do People Like Montblanc Legend? Firstly, no-one seems to dislike Legend. In fact, it’s generally well-received. If anything, the largest complaint from those testing the fragrance is that it’s somewhat weak and hard to detect. Of those that did have negative comments, it was that the composition struck them as somewhat generic and bordering on the synthetic side. However, most people found it particularly light and refreshing. In fact, a few comments were made in how versatile this would be for wearing to work. Overall, there didn’t seem to be any demographic that liked or disliked Mont Blanc Legend in particular. The results were somewhat scattered with no visible correlation. When Should You Wear Mont Blanc Legend? On the whole, Mont Blanc Legend is a fragrance that can be worn all year. Nevertheless, there’s a small peak in mid-spring where its aromatic notes will be at their most appropriate. Otherwise, it’s a very versatile fragrance that can be worn at any time. Similarly, Legend is an all-day fragrance that doesn’t seem to be fixed to a particular time of day. It’s best suited for the daytime but would be absolutely fine in the evening and night. With regards to the age best suited to wear this fragrance, we’d place it as an ideal choice for someone in their thirties. However, it could also be worn by a young professional in their mid to late twenties. This leads onto our comments for the most suited occasion. As a rather mild and subdued fragrance, it would be perfect for the office. As it doesn’t have a character or strength that we be off-putting in close quarters, it would be great with colleagues and clients alike. 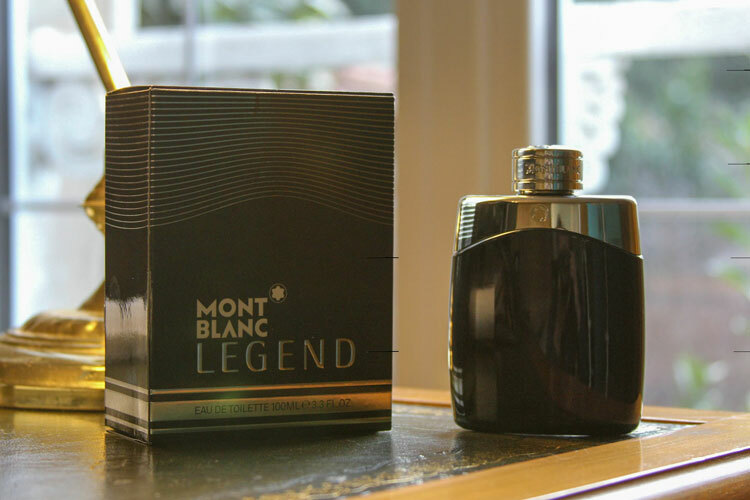 This links back to Mont Blanc’s marketing notes in that Legend is a combination of notes that evoke strength and tenderness. Indeed, it would be a fragrance that inspires confidence without being arrogant. In that light, Legend isn’t a fragrance that would help romantically seduce but create trust with clients and employers. Finally, we’d say that although Legend is conventionally masculine, it certainly isn’t strong. Thanks to the fruit and almost aquatic notes, it’s much more moderate. Mont Blanc Legend’s bottle design was inspired by the Meisterstrück pen. Made from jet black glass and glimmering metal, it does seem to share a resemblance with the iconic pen or even a Montblanc ink bottle. The metallic cap is also very eye-catching with an embossed Montblanc logo and banner around the edges. However, it’s a shame that the metal shoulder isn’t fixed properly onto the bottle and tends to wiggle quite easily. Similarly, the atomiser is quite tough and when only lightly pressed, sprays like a water gun rather than a mist. Meanwhile, the packaging is somewhat reminiscent of Yves Saint Laurent L’Homme, consisting of black cardboard with silver details. Although some believe Mont Blanc Legend to be generic and overly synthetic, it’s a fragrance that has its own particular uses. Its subdued and modest composition makes it perfect for almost every working environment and perfectly suitable for small spaces. Reviewed by Charles-Philippe Bowles, on 15 January 2018 . "A pleasant if generic fragrance. Some may find Legend to be a synthetic fragrance. However, it's a worthwhile fragrance that offers a lot of versatility." I really didn’t enjoy this. Found it to be very synthetic without much going on. I’m surprised that people like Jeremy Fragrance go on about it all the time. Yes, I totally understand. Looking back, I think I may have been overly generous with this review. However, I try to remain neutral as best I can rather than letting my personal opinion get in the way.